Historic parallels are a risky thing, but the similarity between the past and out times is stunning. The Kiev junta – Maidan armed groups relationship and the bloody events known in the history of Germany as the Night of Long Knives are by and large the same stories. As Hitler came to power, the discontent in the ranks of the Sturmabteilung (SA – Storm Detachment or Assault Division), the paramilitary brownshirts led by Ernst Röhm who played the decisive role in the Beer Hall Putsch (the Röhm-Putsch) in 1923, became wide spread. The group started to accuse Hitler of betrayal stressing the need for another «genuinely socialist» revolution. At the time Fuhrer planned to make SA part of Reichswehr, the regular German military. In view of great services and merits earned in the days of revolution Röhm cherished an ambition to absorb the Reichswehr into the SA under his leadership. There were around 3 million brownshirts under his command. The leaders of the Reichswehr feared and despised the SA; they strongly opposed the idea of merger pointing out that it would be wrong to put the armed forces under the command of someone who led irregular formations. 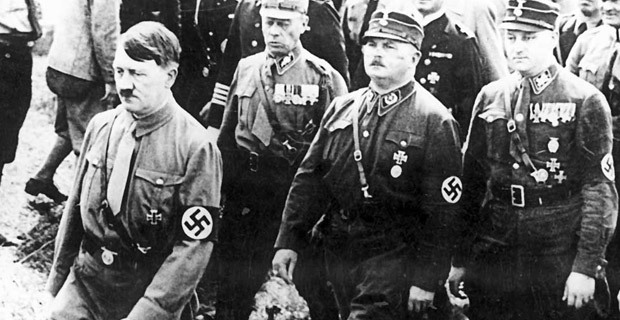 The army leaders planned to make brownshirts part of national armed forces while keeping Röhm away. It was planned to transform SA into a militia force guarding the border with Poland and use paratroopers as instructors responsible for training would-be volunteers before they start service. Those days the German army was a militia force. Only on May 21 1935 conscription was re-introduced. At the time Hitler happened to be between a rock and a hard place. SA leader Ernst Rohm did a great job making SA membership skyrocket. Without endorsement from Hitler, Rohm worked to promote the SA, employing propaganda and recruiting aggressively. At Rohm’s order the SA also swallowed up other militant right-wing groups, such as the Stahlhelm (‘Steel Helmet’), and acquired their members. The inclusion of 314 thousand Steel Helmet members beefed up the Rohm’s standing. He claimed 4, 5 million supporters and wanted a leading position in the structure of border guards and the right to exercise control over military warehouses in Eastern Germany. He met with Minister of Defense General Werner von Blomberg and the leadership of the SA and SS on February 28, 1934. Under pressure from Hitler, Röhm reluctantly signed a pledge stating that he recognized the supremacy of the Reichswehr over the SA, which became a source of raw recruits for an enlarged and revitalized army. Hitler announced to those present that the SA would act as an auxiliary to the Reichswehr, not the other way around. After Hitler and most of the army officers had left, however, Röhm declared that he would not take instructions from “the ridiculous corporal” – a demeaning reference to Hitler. He said Hitler was perfidious and had to leave, at least for a vacation. If he was not with stormtroopers, then they would do the thing without him. While Hitler did not take immediate action against Röhm for his intemperate outburst, it nonetheless deepened the rift between them. The Hitler’s wait and see position was similar to the one Ukrainian junta member Yatsenyuk would take being in his shoes.